Restoration of all the historic architecture was part of the renovation, but the church simultaneously incorporated the installation of a new PA, which would future-proof the house of worship for years to come. The building’s unique architecture did cause some obstacles for the audio installation, though, as it had to deliver acoustically but couldn’t be visually intrusive. Locally-based SoundCop Consulting took on the challenge. The audio specification were finalised quite early in the refurbished process, or so SoundCop Consulting thought… until they – Joakim Hammar and Jacob Julin who took over the company in 2011 – attended a demo by Arva Trading at Stefanskyrkan (Saint Stephens Church). 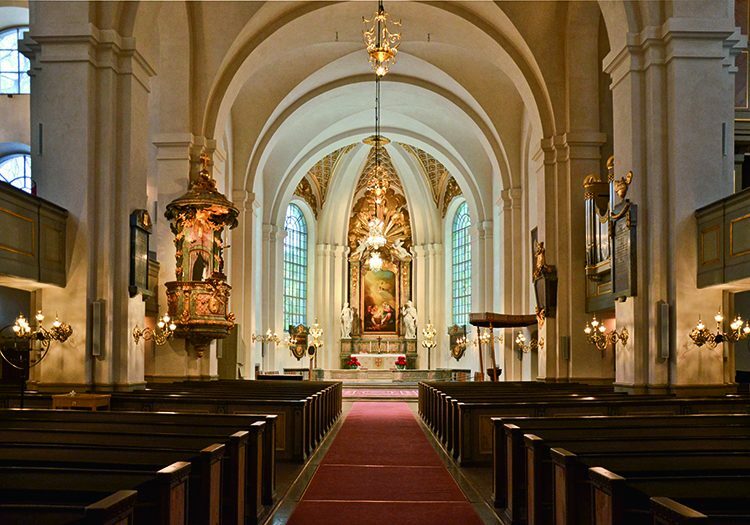 After listening to the setup at Stefanskyrkan and being so impressed, the SoundCop Consulting duo overhauled the system design for Maria Magdalena Church, incorporating their new brand choice – d&b audiotechnik. As Natanael discussed, the unique layout of the church, with such a long nave, did throw up reverberation and speech intelligibility issues. However, by utilising the passive cardioid function of the xC-Series, reduced the level of the reverberant field, maximising speech intelligibility. To achieve the optimum results SoundCop Consulting installed six 24C and 18 16C column loudspeakers, eight 4S loudspeakers, two B4-SUBs and six 10D amplifiers. 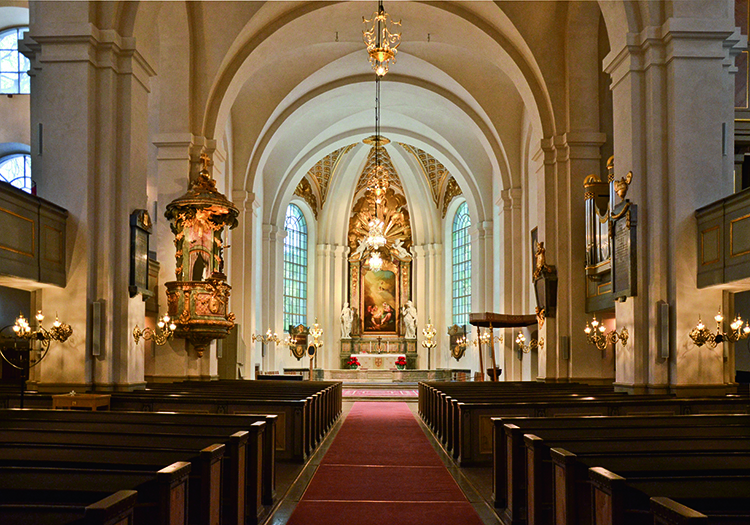 “This is the first big installation we’ve done with d&b xC-Series in Sweden – there have been some smaller churches but nothing on this scale, so now we have a lot of technicians talking about this project. The results have been really good. A lot of choirs come to perform at Maria Magdalena Church and they like to bring their own sound systems, but when they see how well the in-house set-up works, they prefer to use that instead,” continued Natanael. 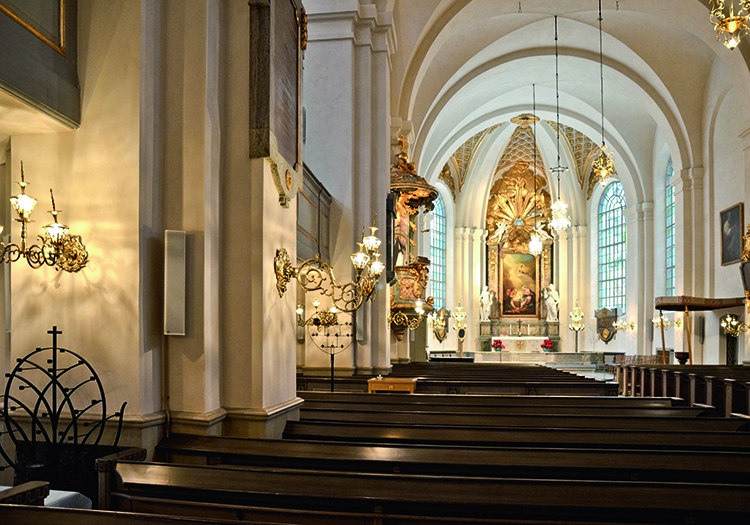 The entire sound set up at Maria Magdalena Church is controlled by a QSC Q-SYS audio control platform, utilising the d&b plug-in for the integration of the 10D amplifiers. The plug-in allows access to d&b amplifier parameters – gain and mute status, amp presets, power on/off status – directly from the Q-SYS interface. The d&b kit is also integrated with a six-channel digital wireless microphone system, a Sony DWX system with handheld and belt pack transmitters, as well as a selection of DPA Microphones equipment including six d:fine headsets, four 4011A cardioid microphones and two 4098 gooseneck microphones. Now that the church community has seen what is possible from a state-of-the-art PA system, first in Stefanskyrkan and now in Maria Magdalena Church, a number of new projects are now underway, with churches following suit and meeting the standard set by Maria Magdalena Church, proving that even the older buildings are still well and truly in the running for modern day worshipping.